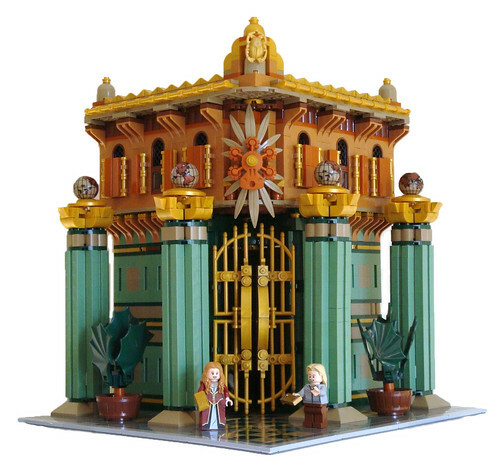 Brick Town Talk: All That Glitters is Gold - LEGO Town, Architecture, Building Tips, Inspiration Ideas, and more! Fortune Lane - (BTT) If you've wondered why the interest rate on your savings account continues to be next to nothing, now you know why - opulence like this does not come cheap! Anything not gilded in gold has been painted in a vibrant Art Deco palette, including the four iconic columns that both figuratively and literally are holding the weight of the world upon them. The interior is no less grand, with sconces that would bankrupt lesser financial institutions.